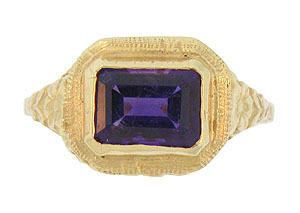 A deep purple rectangular cut amethyst is set into the face of this 14K yellow gold antique ring. 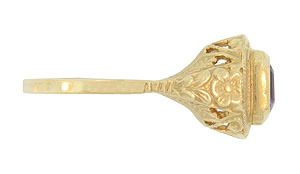 The elevated mount is polished smooth and surrounded by radiating engraving. 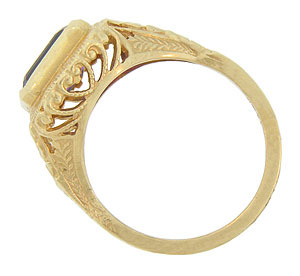 A detailed floral engraving covers the shoulders and sides of the band. Twisting vines curl to form a heart on either side of this elegant mounting. 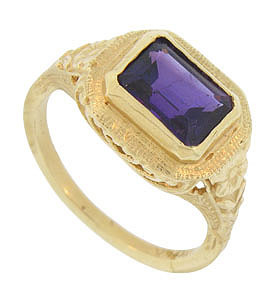 The Art Deco ring measures 10.50 mm in width. Circa: 1920. Size 6 1/4. We can re-size.